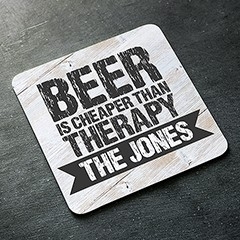 Bring your social gatherings to life with some customised beer coasters. You can create personalised coasters for each of your frequent visitors to make them feel very exclusive. Creating a custom design takes only a few seconds using our intelligent web designer. 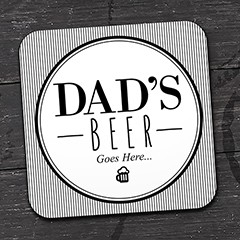 We have a selection of father’s day designs to help make dad feel extra special. We even offer a Christmas themed selection to help make your Christmas party memorable. 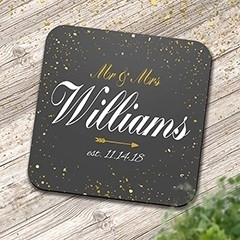 If you want to impress your wedding guests, you can create custom coasters to display each of your guest’s names. Each of our coasters has a wooden base to prevent slippage and a gloss surface to protect them from butterfingers. 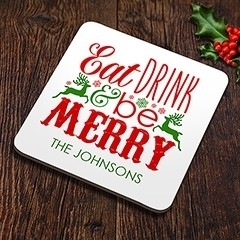 If you are unsure of what gift to give a friend or loved one, a personalised coaster to support their coffee, tea or beer might just be the perfect gift. Our highly specialised printing machines ensure that all our designs are protected from fading, so colours will remain fun and vibrant throughout daily use. Once the designs have been submitted, you can receive them in one of two ways: Absolutely FREE – Come pick it up from the store, we’ll email you when it’s ready! Mail Delivery – we offer both standard and express delivery options Have the perfect custom design in mind? Start designing today!